I recently received a wonderful set of baby book blocks for Angel. Though she is only 8 months old it's never to early to introduce books. Most people don't realize that different visual patterns help in infants brain development. When I worked at the daycare I went through many different classes that taught about different patterns that babies can see, and things that help with their brain and vision development. 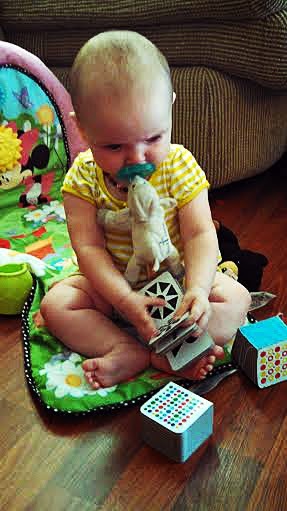 Baby's First Book Blocks, by Dan Stiles, are a great new tool to help with the development of babies brain and vision. 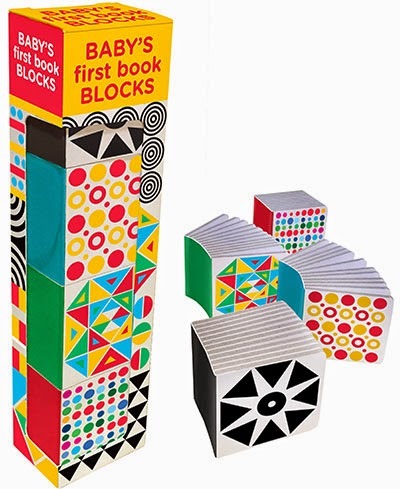 "Combining books and blocks, Baby's First Book Blocks is a set of mini board books, designed to help babies develop visual acuity and encourage motor skills. Did you know that research shows that by just 2 months of age, babies can not only see color, but they can even distinguish between subtly different shades. 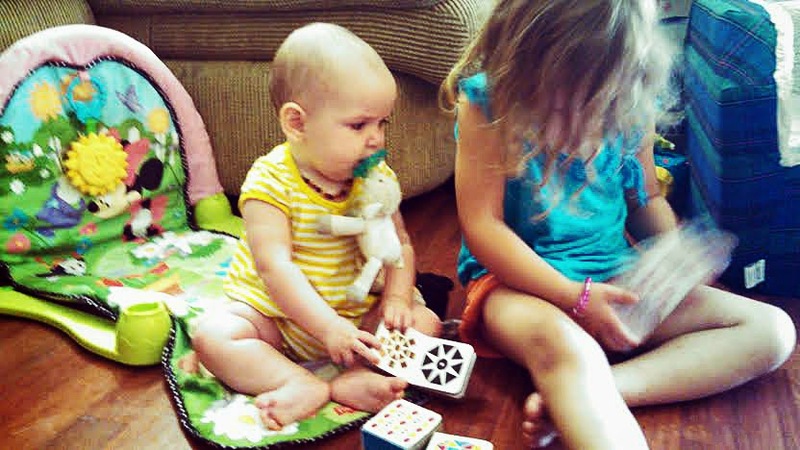 What is important to know is that all babies can develop visual acuity by looking at images. Parents can stimulate babies' visual development by spending just a few minutes each day with baby looking at these colorful book blocks. These books feature bold colors, diverse shapes, and intricate patterns, these little books offer a prime opportunity to interact with even the youngest babies. As your baby grows and begins to develop basic motor skills, these sturdy little books continue to provide plenty of opportunities for educational play-grasping, stacking, sorting and turning pages. I love that these books are multi-age focused. These books are sturdy and can stand up to being played with by baby. Infants, Baby and even Toddlers would love a set of these new books! They are multi-purpose and encourage learning and development! I would recommend getting this set of books for your little one or for a little one you know! How would you like to win a set of these wonderful books for your a baby or child in your life? Simply fill out the form below for your chance to win and GOOD LUCK!! We love books at our house - and with having a new baby in the house - we will need books for her to "read"
I'd love to win these for Jack. Because of his delay, these would really come in handy! I would love to win this for my new nephew MJ.